For centuries glass is a very important material, used by humanity in many different areas, from science to jewelry manufacturing. Nobody knows exactly, when it became such important component of our civilization. The story begins, perhaps, in the desert of ancient Egypt, from the very first, artisans found glass an ideal medium in which to express their art. About 12,000 B.C. the Egyptians perfected a green glass glaze and with it coated pebbles and stones to make jewelry. It took another 5,000 years for the jewelers to discover that a pure glass bead could be formed by building up layers of the glaze. The necklaces made in those lost ages were not unlike the strands of inexpensive, gaily colored glass beads so common today. Glass became the property of the average man, and people who used it in those days liked it for the very same reasons glass is useful today. It was leak proof, evaporation was slowed, and it did not leave a taste- especially when oils, wines and honeys were kept in the containers for any length of time. Men of science adopted glass jars for their chemicals and medicines, and traders preferred glass containers for carrying certain cargoes on long voyages. But, best of all, the glass vessels could be used over and over again. Completely transparent glass was also much sought-after. 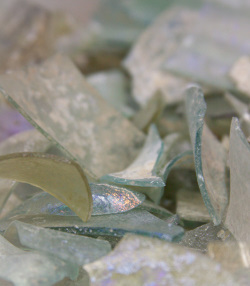 Finally about 200 A.D. the Romans discovered the right ingredients to render glass entirely transparent-so clear, in fact, that they called it "cristallo" because it reminded them of rock crystal. These days, glass a very important component of a human habitat. Nobody would underestimate the importance of the glass in people's life. Craftsmanship and knowledge of the centuries is polished to perfection at J & A Glass Creations. Since it was founded J & A Glass Creations has been working with homeowners to satisfy their glass needs. The trained professionals at J & A Glass Creations are ready to assist you with any glass service or product you may require for your home.